A common theme of the Modern Family reviews here at the A.V. Club is that the episodes where there’s some sort of meaningful character development tend to be greeted with praise. That’s in large part due to the medium of television itself. Spending years and years with characters insists upon constantly examining their relationships, flaws, triumphs, and setbacks. TV series’ are ongoing stories, and when it comes to the sitcom, where plot threads are initiated and dropped at a moment’s notice, the most successful and memorable payoffs typically come from character progression because they’re one of the few reliable anchors week in and week out. What’s refreshing about “The Alliance” is that it’s the exception to the rule. It’s an episode that doesn’t really bother with digging deep into character motivations, and even a potential late-episode emotional payoff is undercut by a joke. 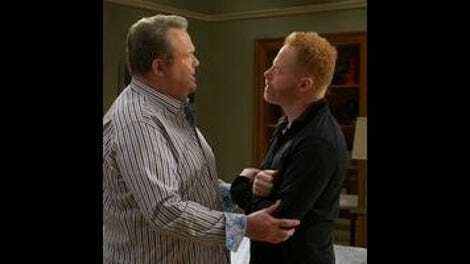 In fact, “The Alliance” is largely a typical episode of late-period Modern Family, and it especially embodies a lot of the meandering plot details that have defined the show’s eighth season. So, the same old plot points are trotted out: Claire is still struggling to remove herself from the presence of her father at the company, Jay is still looking for ways to define himself post-retirement, and Haley is still pursuing a romance with Rainer. “The Alliance” isn’t interested in pushing those stories any further though. Instead, they’re the catalyst for a funny, engaging, inventive half-hour that sees the three people who married into the Pritchett family working against the familial tyranny often practiced by Mitch, Claire, and Jay. Early on in the episode we learn that for years Cam, Phil, and Gloria have been getting together whenever one of them needed to hide a mistake they made. The reason for the alliance is the fact that their significant others are so judgmental, ready to jump on any mistake they make and harp on it until, as Cam might put it, the cows come home. Where Modern Family can occasionally deploy something akin to this alliance, which exposes a rift in the family, in a cruel or unnecessary fashion, this alliance is rooted in seasons of behavior that surely we’ve all noticed. Claire, Mitchell, and Jay are all control freaks, with a hefty dose of stubbornness to go along with it. So it makes sense that the more sensitive souls of the group would find a way to lean on each other. The result is an exaggerated covert operation that’s ripe for laughs, and “The Alliance” delivers. What’s remarkable about the episode is the way in which it’s structured. There’s a dénouement that changes our understanding of the episode’s events, but the episode doesn’t rely on that as the lone payoff. Instead, the final twist just enriches everything that came before it. So, “The Alliance” is a funny and fast-paced episode to begin with. It takes a familiar concept—the whole family is coming together in order to vote on the location of their next family vacation—and finds a way to keep things fresh. Here, that’s the alliance. What starts as Phil, Gloria, and Jay sneaking out under the guise of picking up orange juice turns into a frantic game of keeping secrets hidden, as Gloria has lost the dog, and Cam has failed to kick out two intimidating Russian squatters from the upstairs apartment. 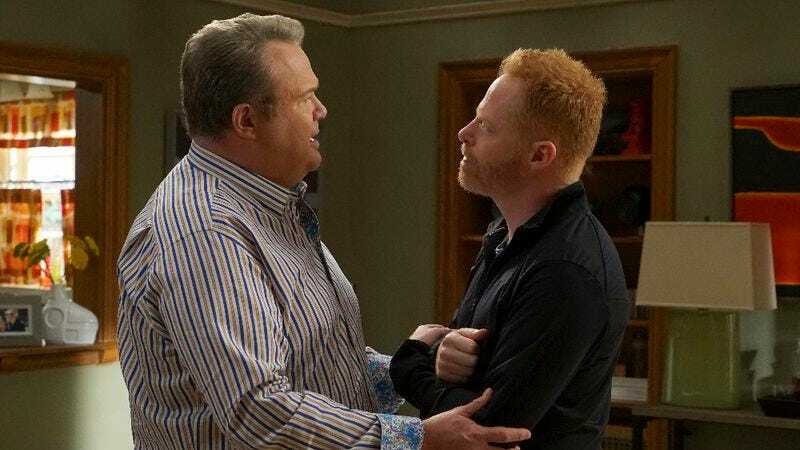 The setup allows for some of Modern Family‘s strengths to shine: its crowded dialogue and flurry of jokes, its ability to draw humor from chaotic plotting, and the cast’s committed performances. There’s barely any room to breath in the episode, as Cam, Phil, and Gloria trade punchlines and secrets, but that’s what makes “The Alliance” so appealing. It’s packed to the brim with jokes and gags, and they make the last-episode twist all the more rewarding. Sometimes, an inventive and playful structure is all that’s needed to make an episode of Modern Family stand out, especially in these later seasons that are defined, more often than not, by complacency. There’s still a lot to nitpick here, from Luke’s barely-defined success at his new job at the club, to just what it is that Haley sees in Rainer, but those complaints are overshadowed by just how brisk and delightful this episode is. As the secrets come out, and the Pritchetts react by unilaterally choosing the vacation destination as a form of punishment, “The Alliance” pulls back to reveal that it was Phil, Cam, and Gloria’s plan all along. They may have had some real things to hide, but their plan was always to convince their partners that they were in control, and that they wanted to go to Italy for their vacation, peppering their lives with subtle mentions of Italy in order to gain that unknown influence. It’s a deft touch, and shows that Modern Family still has some playfulness and imaginative spirit to spare in its eighth season. Great cut to Mitchell holding a jug of orange juice after Cam says he’s going out to pick up orange juice. Haley going full Claire on Rainer’s angsty teenage daughter April was a thing of beauty. We’re always praising Ty Burrell’s physical comedy, so it should come as no surprise that his “shock collar” bit was delightful.